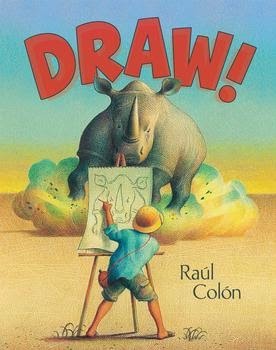 Kids' Book Review: Review: Draw! Draw! is a wordless picture book about “creativity and imagination”. It’s filled with wonderful, inspiring illustrations of wildlife and landscapes. We see a boy sitting in his bedroom reading a book about Africa. He gets out a sketchbook and starts drawing. The next thing you know, he’s on safari in the midst of elephants and zebras, giraffes, monkeys, lions and many other wild animals. Sketchbook and pencil in hand, the boy is depicted as part of the landscape as he draws all the animals, until finds himself being chased by a rhino! Escaping up a tree, the tables are turned on the boy with one of the animals drawing a picture of him. The boy finally rides off into the sunset on an elephant. Following his imaginary adventures is a final scene of the boy at school showing the class his amazing drawings. I hope Draw! stirs many young imaginations. It’s certainly a book that adults could use to encourage children to try their hand at storytelling in both words and pictures.